November 16, 2015 – Last week, we explored the Sonoma Coast to learn more about Broken Clouds Chardonnay, but today we’re visiting Monterey County, California where our Chiare Blanc de Blancs are cultivated. From weather to bottle production, learn how our wine goes from vineyard to your local ALDI. 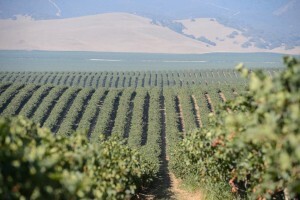 Monterey County is ideal for growing white wine grapes because of the cool nights and moderate days. The cool nights are extremely beneficial for Pinot Blanc, allowing it to retain its natural acidity. Monterey has a wonderful coastal influence that ensures flavor development happens evenly, ensuring all berries have the same characteristics. The 2014 vintage of the Chiare Blanc de Blancs is one of the highest qualities you can purchase. Because the climate was very dry with little rain, it led to a well-concentrated blend of flavors. Pinot Blanc is typically the first grape to come off the vine – picked around 21 Brix (or sugar level). The Riesling and Muscat hang longer on the vine to ensure they’ve reached full maturity, maximizing their beautiful aromas. The grapes are picked at a lower brix to ensure the sparkling wine has modest alcohol content. Once the grapes are removed from the wine, they are whole-clustered pressed into stainless steel tanks for primary fermentation – which is when the juice from the grapes is turned into alcohol. Then, this is blended before undergoing secondary fermentation using the Charmat method – bottling under pressure. By adding small amounts of Riesling into the blend, exotic notes of pineapple peak through, while the inclusion of Muscat contributes aromas of honeysuckle and apricots. Love ALDI wine? Visit our Wine Cellar to uncork more delicious savings. Spread the love by clicking one of the share icons above! Availability and price of alcoholic beverages vary by store.